Top Young Israel executives speak to Arutz Sheva at their organization's annual gala dinner. The National Council of Young Israel (NCYI) on Thursday night held their annual gala dinner, as well as an awards ceremony for honorees who made a significant impact in Young Israel and their Jewish communities. Speaking to Arutz Sheva, NCYI President Farley Weiss said, "Part of the mission is to support and strengthen the State of Israel, and to strengthen Jewish communities in our shuls (synagogues - ed. ), and also to do outreach for those who are unaffiliated and help bring them on board to our shuls, and to do different activities to help our kids, our children." He noted that Young Israel does "a multitude of things...from everything from finding a rabbi to training rabbis and even doing conferences...in different regions and Young Israels around the country." "We have over 50 Young Israels in Israel, we're a very Zionistic (sic) organization, we were the only Jewish organization that had a call-in to the White House to recognize Jerusalem as the capital of Israel. Our focus is on support of Israel and strengthening Israel, and we're outspoken in those efforts, and clearly we support those who want to make aliyah (immigration to Israel - ed.) too." Noting the "amazing" turnout at the event, Weiss the number of attendees showed the support Young Israel has in the country, and that people "care about the issues Young Israel cares about." NCYI First VP Dr. Joseph Frager said, "National Council of Young Israel was established in 1912, the purpose...is to keep the Jewish community vibrant, to keep it together, to keep it strong, to keep it young. And the truth is, to do outreach, to bring Jews in who've been lost, to bring Jews back who've been lost, and also, to provide fresh troops to Israel." In addition to his activities with Young Israel, Dr. Frager writes a weekly parsha (Torah portion) column for Arutz Sheva. Speaking about the awards given at the ceremony, Weiss said, "We're honoring these people, who made an impact, who made a difference, in the Young Israel movement, and for Jerusalem, for the issues of Israel that we care so strongly about." 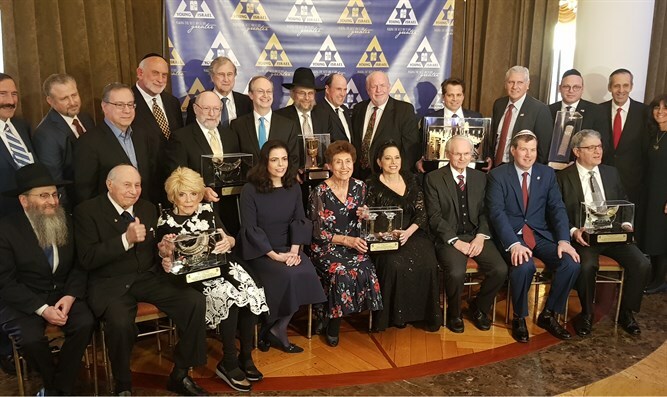 "The honorees are people who dedicated their lives to the Jewish people, they've helped the Young Israel movement, and they want to continue helping the Young Israel movement thrive, flourish, and be strong," Frager added. Figures such as Former White House Communications Director Anthony Scaramucci, Taylor Force's father, and Zionist Organization of America President Morton Klein, also spoke at the event.